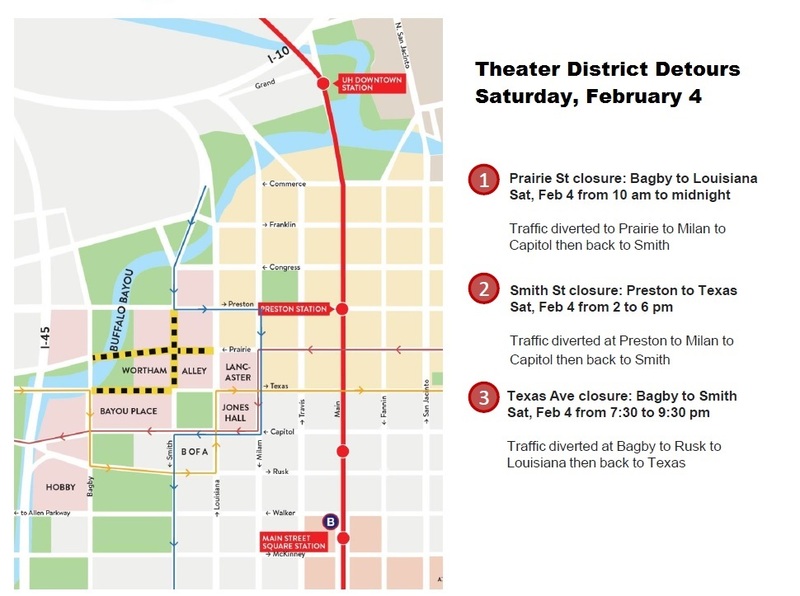 Traffic will be heavy the evening of February 4 due to Super Bowl weekend events in the area, especially in the Theater District. It is important to us that you have the best possible experience at the Alley Theatre. Arrive Early: Be advised that due to Super Bowl activities, there are several surrounding street closures. Please allow ample time for your arrival as we expect there to be increased traffic downtown. Know Where to Park: Due to street closures, patrons wishing to access the Alley Garage may only do so via the Louisiana Street entrance. Theater District Parking can be accessed via Capital Street. Bring Cash: While the garages are expected to accept Alley Parking vouchers, with so much activity, it is possible that an attendant may not accept it. Please be prepared to pay cash ($10) and inform the Alley Theatre Box Office upon arrival at the theater. Drivers are encouraged to enter or exit Downtown Houston from the West side. The street closures on the East side of town may impact your drive in and access to certain parking areas may not be available.